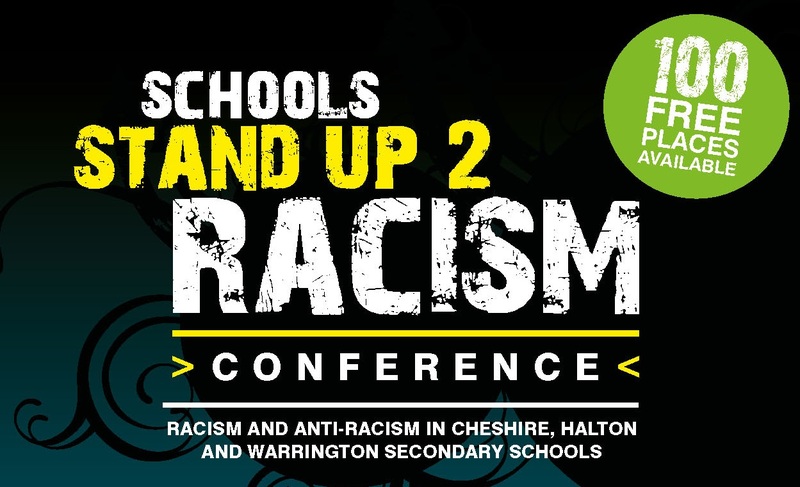 The Schools Stand Up 2 Racism Conference will give delegates the chance to be the first to find out what the project has discovered and its recommendations. Book your free place now! Over the past three years, Schools Stand Up 2 Racism has been researching racism and its effects in Cheshire, Halton and Warrington secondary schools. This conference will give you the chance to be the first to hear the full project findings and recommendations, as well as find out more about the resources available to help you implement effective anti-racist education. You will also be able to participate in a range of innovative practice based workshops. – Key note speaker, Robin Richardson: Robin is a leading race equality education consultant and author. Robin’s full biography can be found here. – Presentation of Schools Stand Up 2 Racism findings, recommendations and resources. – Group discussions on the conference themes and question and answer sessions. All delegates will leave with a free pack: Integrating Global and Anti-Racist Perspectives within the Secondary Curriculum (worth £60). You will also receive a free place on the Schools Stand Up 2 Racism in-service training, taking place throughout November.